Doesn't this look fun? (Note the rescue divers in their 7mm suits...brrrr). 2014 7th Annual Freezin' for a Reason. This weekend--February 7, 2015--you'll have a good reason to tell your friends and family to go jump in a lake! That's right--people will be jumping in Lake Anne on purpose. But it's for a great cause, and that's why participants do it year after year. I'm talking about the Annual Freezin' for a Reason Virginia Polar Dip. Superheros, Gumby, and whole lot of BFFs in pink tutus will make the plunge for raise money for Camp Sunshine. It's the ice bucket challenge on steroids. Charities don't get much worthier than Camp Sunshine--the camp provides respite, support, joy, and hope to children with life-threatening illnesses and their immediate families. The year-round program is free of charge to all families, and includes 24-hour onsite medical and psychosocial support. Camp Sunshine also provides bereavement sessions for families who have lost a child to supported illnesses. Freezin' for a Reason raises much needed money to send children to the camp. This year's goal is to raise $100,000, which will allow 50 families from the Mid-Atlantic area to come to the camp. Through pledges or self-sponsorship, each participant will raise/donate a minimum of $100 for the opportunity to take the icy plunge. In addition to knowing they've helped a child in need, they all also receive very cute shirt that proclaims "I DID IT" event shirt. If you aren't ready to jump, come and watch the fun--it's a great time on the plaza! 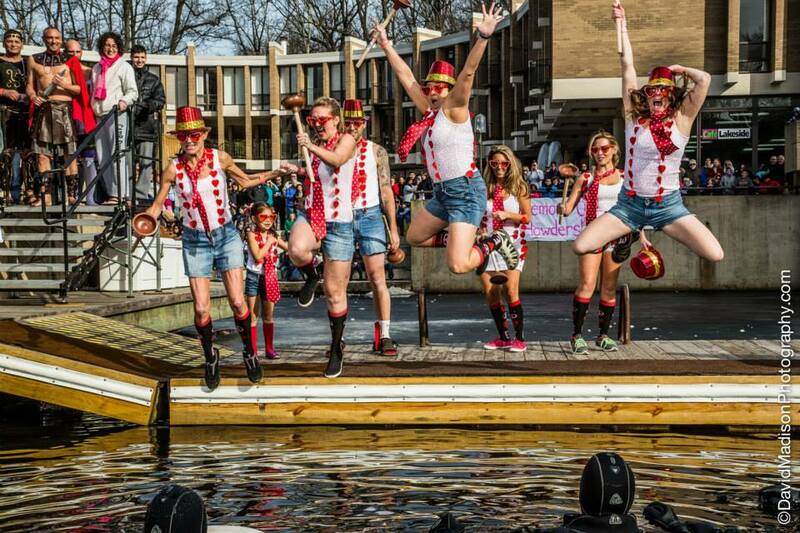 The plunge takes place on Saturday, February 7th at Lake Anne Plaza. It kicks off at 12:00PM with family-friendly activities and warm-up, and the actual dip is scheduled to start at 2:00PM. For the fifth year, 97.1 WASH-FM morning show radio personality Chilli Amar will emcee the event. Event sponsors are: Lake Anne Plaza, Whole Foods Market - Reston, Reston Lifestyle Magazine, Tropical Smoothie Cafe, David Madison Photography, Reston Association, Reston Community Center, Spotted MP (Marketing + Public Relations), Kalypso's Sports Tavern, Fairfax Christian School, 97.1 WASH-FM, Salon Khouri, Fusion 360, Small Change Consignment, and Sheraton Reston Hotel. For more information about the event or to register to participate, visit www.freezinforareason.com or become a Facebook Fan (Virginia Polar Dip). Are you brave enough for the challenge?